"MayThe4thBeWithYou" - Blog @ That Awesome Shirt! 10 to 25% off everything Star Wars. Design by Humans: Free Gift! May The 4th Be With You! 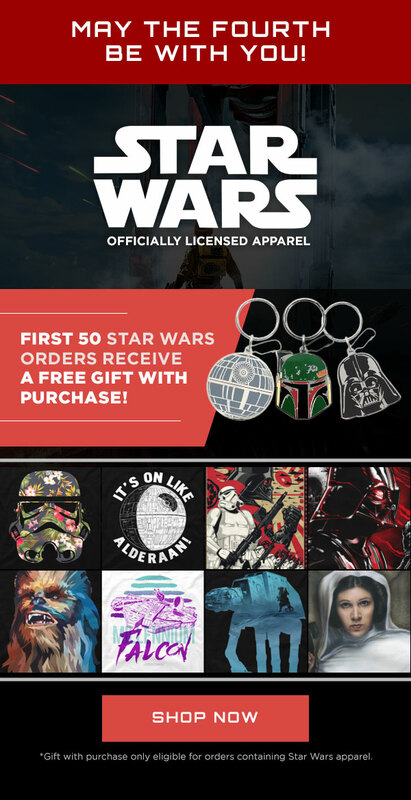 First 50 Star Wars orders receive a free gift with purchase! Reimagining 4 Star Wars posters! This is a pretty damn good sale! Get in quick! 75% Off over 100 Star Wars items. That's why it's the "One Fourth" sale. Some items have limited stock, get in quick! Only valid until 4th of May, 2017.